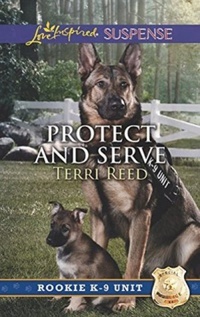 When rookie K-9 officer Shane West and his German shepherd partner find the lead police dog trainer murdered, he's determined to bring the killer to justice. But then he discovers Gina Perry hiding nearby—a pretty junior trainer who had the motive, means and opportunity to kill her boss. Gina insists her troubled brother is the real murderer…and this isn't the first time he's killed. And when Gina's brother comes after her, Shane is assigned to protect her and uncover the truth. Suddenly, Shane—a cop who always hoped to join a big-city force—vows to stay by Gina's side as a murderer lurks in the small-town shadows.